Bath towels can be a fun way to decorate your bathroom. 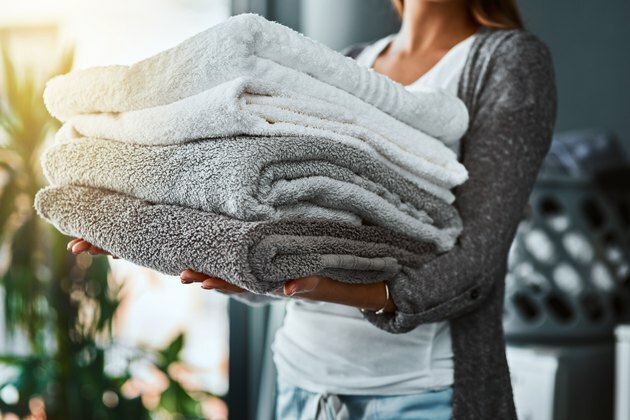 You need towels to dry off quickly from a shower or bath, but taking a moment to luxuriate in the wrap of a comfortable, plush towel can give us a moment of respite from your busy lifestyle. Fortunately, there's a variety of bath towel styles and materials to choose from, and you may want to consider different types of towels for different occasions. Egyptian cotton towels are made of the highest quality cotton and give you that feeling of luxury while also being highly absorbent. Egyptian cotton fibers are longer than any other cotton fiber grown in the world, and they absorb moisture very well. Egypt's hot, dry desert climate contributes to the length and absorbency of the cotton fibers grown there. When cared for, bath towels made from Egyptian cotton last for many years. Cotton grown in the Aegean region of Turkey is soft, fluffy and strong, which makes Turkish towels absorbent, although not as absorbent as Egyptian cotton. Still, they work well in warm, humid climates. Pima cotton towels are from cotton grown in the American Southwest. Known by the brand name Supima cotton, Pima cotton grows in a desert climate and is a strong, absorbent fiber. Organic cotton towels are made with fiber grown without artificial fertilizers and pesticides, and their intent is to leave a small carbon footprint in the manufacturing process. Towels made from bamboo and hemp are usually organic, as well. Many cotton towels are terry cloth. That means they have larger threads and are woven with an extra yarn, which helps the towels absorb moisture. When a towel is made of combed cotton, it means the cotton is combed to remove shorter threads and debris, leaving the longest and strongest threads to be made into fabric. Microfiber towels are made of a blend of polyester and polyamide givers. Microfiber is good at picking up dust, dirt, makeup and oil, and doesn't need chemicals to remove them. Bamboo towels are often made from a bamboo-cotton blend. Bamboo is naturally anti-bacterial and easy to grow, and this eco-friendly fabric makes a highly absorbent fabric. Hemp, like bamboo, is naturally mildew resistant and a good organic, eco-friendly choice. Modal is a cellulose from beech trees that is said to be 50 percent more absorbent than cotton. Check labels and make sure the fabric is what the label says it is. A towel may say it's Egyptian cotton, but when you read the fine print, you'll see that it has other materials added in. All towels come with a fabric weight, measured as grams per square meter – or GSM. Lower GSM towels are lighter and thinner, so they're great for gym, travel and beach use. Heavier, thicker GSM towels are your nice towels to use for yourself, family members and your guests. Towels range from washcloth size, which is about 13-by-13 inches square, to bath sheets, which can be up to 40 to 70 inches rectangular. In between are several more categories of towels. Washcloths are what you use to wash your body and face in and out of the shower or bath. Finger towels are small hand towels, usually 11-by-18 inches, often used in guest bathrooms or as accent decorative pieces. Hand towels are typically 16-by-28 inches or 18-by -30 inches. These are used to dry hands and can also be decorative. Bath towels are what you use after a shower or bath. These range from 27-by-52 inches to 30-by-58 inches. These are easier to clean and hang than bath sheets. Bath sheets are oversized for a luxurious feel. These are often used in spas or hotels to give guests that pampered feeling. Bath towels weigh about 21 ounces, while bath sheets weigh as much as 24 to 28 ounces. Heavy doesn't always mean quality, however. A lighter towel made with luxury fabric may work better than a heavier towel made with lesser quality cotton. Good bath towels are soft and strong. Towels are like throw pillows. Bold and patterned towels can add color elements without painting walls or buying new fixtures. They can pick up accent colors in your bathroom or serve to draw the eye to them. Towels can also fit in with the rest of the surroundings. Neutral colored towels work nearly anywhere. Consider a basket of rolled towels in a guest room or bathroom as a fun way to display them and let guests know which towels are for them. Remember, when you feel a soft towel in the store, it may not feel as soft after a few washes. Many towels are coated with fabric softener before they are sold. Towels made of Pima or Egyptian cotton, along with rayon or bamboo, are smooth and silky and not as likely to get fuzzy. For the first wash, add a cup of vinegar to the cycle. This will help set the color. Also, towels are likely to shrink so use the right heat settings when drying them. Use a lower heat setting or air dry them after they have partially dried to preserve the fibers.